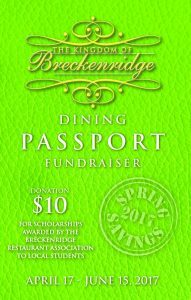 This $10 dining passport (valid for 2 people) gives you exclusive access to local deals, and the best part is that Breckenridge Restaurant Association uses the proceeds to fund scholarships for local students. Last year alone, they awarded $15,000 in scholarships! Not only is this for a great cause, but the passport includes many local favorite spots in Breck, including Twist, Hearthstone, Relish, Briar Rose Chophouse, Apres Libations and more. For a full list of participating restaurants and respective deals, click HERE. Passports are available for purchase at the Breckenridge Welcome Center and at each participating restaurant location. 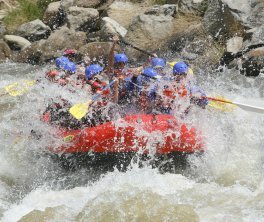 Performance Tours (voted 1st place in Best of Summit last year) is offering a 2-for-1 rafting trip valid on a Browns Canyon Full Day trip (valid until June 25, 2017). They also offer 20% off Arkansas or Blue River trips (vail until Sep 5, 2017). Just mention the “Local’s Deal” when booking to take advantage of either discount. Local residents who have a Colorado Drivers License with a Summit Country or Park County address listed will can play 18‐holes at the Breck Resident Punch Card rate of $44 walking or $62 with cart on select dates. The rate for 9‐ holes is $22 walking, $32 with cart. You do not have to purchase a punch card to receive this local rate. Bear Course is already open, Elk Course opens the weekend of May 19, and Beaver Course will open Memorial Day weekend. Click HERE for more info. We only have a few more weeks until tourists start descending on Summit County again, so be sure to take advantage of the mud season in Breckenridge before it’s too late! Still looking for things to do? You can always come by and see us at Lincoln Park and check out our model home to prep for our Phase 3 launch this summer!